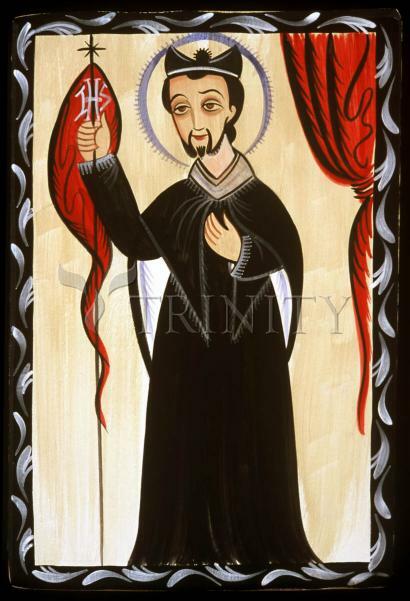 In New Mexico San Ignacio is embraced as the patron of the secretive Brothers of Our Father Jesus the Nazarene, a lay organization commonly known as the Penitentes dedicated to prayer and penance. He was also appealed to as a patron of repentance, return to the sacraments, and against illness and witchcraft. St. Ignatius was born in the family castle in Guipzcoa, Spain, the youngest of 13 children, and was called Iigo. When he was old enough, he became a page, and then a soldier of Spain to fight against the French. A cannon ball and a series of bad operations ended his military career in 1521. While St. Ignatius recovered, he read the lives of the saints, and decided to dedicate himself to becoming a soldier of the Catholic Faith. Soon after he experienced visions, but a year later suffered a trial of fears and scruples, driving him almost to despair. Out of this experience he wrote his famous "Spiritual Exercises". After traveling and studying in different schools, he finished in Paris, where he received his degree at the age of 43. Many first hated St. Ignatius because of his humble Lifestyle. Despite this, he attracted several followers at the university, including St. Francis Xavier, and soon started his order called The Society of Jesus, or Jesuits. There are 38 members of the Society of Jesus who have been declared Blessed, and 38 who have been canonized as saints. He died at the age of 65.